What an experience!! So glad we took it! Saw parts of Singapore we couldn’t see on our other tours!! Malheureusement notre mauvaise connaissance de l’anglais ne nous a pas permis de comprendre les commentaires. If you are one who doesn't like to venture out on your own after dark but want to see the city in that way, this is for you. 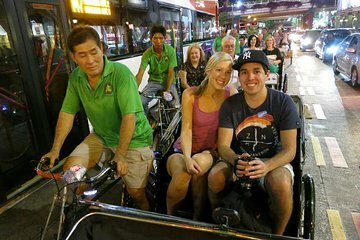 The included dinner is fun and enjoyable, the trishaw is adventurous as well, and the boat tour gives you a fantastic view of the sights and lights from water level. You will be in the safekeeping of a guide and the company of fellow travelers. Like the history from the tour guide. Chinese dinner was pretty standard but the bike ride and boat was great! there was no real tour in Chinatown - I expected a more insider tour (go by yourself…). While the food was o.k., the restaurant looked poor with ongoing works. The trishaw was more a race to the port then an enjoyable ride through hidden places. Fortunatly the boat ride was great and truly excellent. the tour and guide were great. The only hitch is, after you book you must contact the tour company in Singapore 24 hours in advance. Coming off a cruise ship and being at sea 48 hours in advance is problematic. This was a great evening. Pick up from hotel perfect and slight wait only at start for all guests. Meal in Chinatown good and the rickshaw guys great and trip good fun. Finished with river and bay cruise which was lovely and taken back to hotel. Great value your and would recommend. The bus picked us up at a nearby hotel and took us to another hotel. Disorganized at first, but all was soon sorted out. Our guide was very informative and spoke so all could hear. The Chinatown visit was very interesting. Dinner was good, not great. 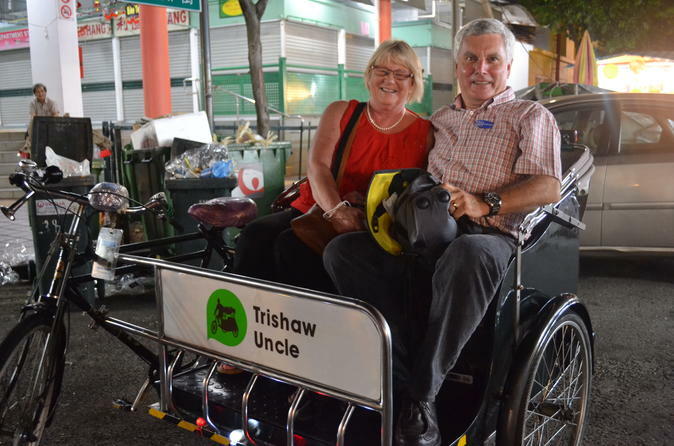 Next we had the trishaw tide which was a highlight and so much fun! Lastly we took the bumboat on the river. Beautiful and so interesting! We saw part of the sound and light show as well-it was awesome! Our guide made sure we got into the proper vehicle to return to the hotel. Would definitely do this again! !